Martin Strel: "The animals have just accepted me"
A Slovenian man has battled piranhas, alligators and exhaustion to become the first person to swim the entire length of the Amazon river. Martin Strel, 52, completed the 5,265-km (3,272-mile) marathon in 66 days when he neared Belem, 2,440km north of Rio de Janeiro, on Saturday. 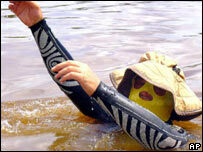 Mr Strel, known as "fish man", was suffering dizziness, nausea, diarrhoea and sunstroke as he neared the end. He has previously completed the Yangtze, Mississippi and Danube. Mr Strel formally completed his epic achievement four days ahead of schedule, averaging 52 miles a day. The BBC's Gary Duffy in Brazil says this was Mr Strel's most formidable challenge to date. The Amazon is the world's largest river, and the second longest. It is home to piranhas, alligators, bull sharks and anaconda snakes, while other dangers included whirlpools, tidal waves and armed bandits. Mr Strel ignored doctor's orders to complete his task. Martin's son, Borut, confirmed the swim had finished: "He's hit point zero." "There will be a ceremony on Sunday in Belem, but he finished today," he told Associated Press news agency. 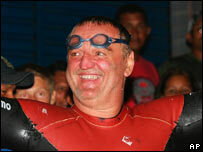 Martin Strel set three previous long-swim records, starting with the 3,004km Danube in 2000, then the 3,797km Mississippi in 2001 and the 4,003km Yangtze in 2004. Guinness World Records said it would take a few weeks to confirm the record. On Thursday, during a break in his attempt, Mr Strel said the ocean tides were so strong they were sometimes pushing him backwards. He added: "I think the animals have just accepted me. I've been swimming with them for such a long time that they must think I'm one of them now." Mr Strel said he was at times in so much pain, "I could not get out of the water on my own". He said: "Once, they had to take me to the hospital to check my heart. But everything turned out OK."